Jakob Lewis Rukov is the co-founder of bug startup Insekt KBH, who have a small cricket farm in the centre of Denmark’s capital city of Copenhagen. He turned to bug food innovation in 2011 after reading an article on the meat industry’s disastrous effect on the planet. This year, he is collaborating with a group of like minded sustainable foodies to bring bug cuisine to one of Europe’s biggest festivals, Roskilde, held near the capital. Since 2014, it has been Roskilde’s mission to bring innovitve and varied food to its 130,000 visitors in the resident food courts, the home of pop-up shop ‘Crick’it’, where Rukov has established his food stall. ‘Crick’it’ is a collaboration with Suhr’s Culinary School, Bugging Denmark and the maverick Danish chef Rasmus Leck Fischer. The team are using the open-minded and curious nature of festival goers to show the possibilities of moving to an edible insect diet. Rukov explains, “There are so many barriers to eating insects that we struggle with as humans. But these barriers are purely in the mind.” At a huge, 8 day festival, punters become a captive audience who are more open to pushing themselves outside their culinary comfort zone. Fischer literally wrote the book on insect edibles, Insectivore, and has adapted his gourmet delicacies into festival friendly street food. Already extremely popular with curious festival go-ers is the bug burger. Chunks of succulent chicken are served in a spicy buffalo meal worm BBQ sauce, paired with a wax moth larvae mayo and salad. The only thing with a cricket-like crunch is the toasted brioche. The burger is washed down with one of Rukov’s punchy fresh lemonade juices, which miraculously contains 15 crickets, ground up and sinking to the bottom. You have to stir it well before taking a sip. The facts on bug production against the meat industry are hard to argue with. The CO2 required to make 100g of beef is around 2000 times more than what it is to produce the same amount of insect meat. Rukov’s crickets are almost carbon neutral. They feed on spent grain from beer breweries and the apple pulp used to produce the Insekt KBH juice. They’re protein rich, and the 15 cricket lemonade contains 50% of your recommended daily intake of Vitamin b12 (only really found in animal bi-products and supplements). The use of an underground farm in the city centre reimagines our urban spaces: “I wanted to change the profile of the city as somewhere food comes in, and trash comes out, to somewhere that makes food for itself,” adds Rukov. 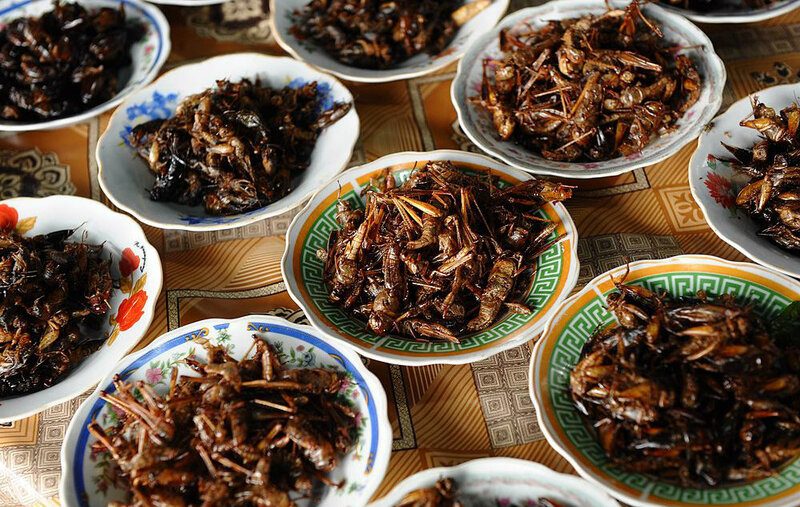 Organic issues aside, insect meat could be a strong part of our future sustainable development on planet earth. If it takes a little cricket pesto and a rock festival to get it going, then please, pass me a recyclable fork.